For most cat haters, not owning a cat should be sufficient to avert any cat-related crises. But for some – to wit, a man in New Zealand by the name of Gareth Morgan – it’s not enough just for him not to own a cat. No, Morgan wants to make sure that no one else in the whole country owns a cat either. Control freak is perhaps too meagre a description for this man, but judging by his wish to bring an entire nation to heel, I think we can safely say he’s a dog person. Morgan’s problem with cats is that they kill birds. And obviously he likes birds better than cats. And he especially likes those improbable flightless types that continue to survive in New Zealand and which, by Darwinian standards, are evolutionary freaks that should have died out long ago if they lived in a land mass with normal predation. Similarly, Morgan clearly has no serious dislike for the rats and other vermin that are so ably controlled by the feline population. He’s not alone in this interventionist view of things. Plenty of people seem to subscribe to the vaguely Old Testament notion that human beings are the custodians of nature – that we’re in charge of it, and that it won’t be able to manage without us. It is unusual, though, to hold with that principle on the one hand, and on the other, to blame animals, rather than humans, for the despoliation of the natural world. Morgan claims that the average house cat brings home 13 pieces of prey a year. Cat owners recognise these as gifts. That would be one per month, plus an extra one on the cat owner’s birthday. It seems rather a low average, suggesting that Antipodean cats are quite a bit lazier than their northern European cousins. 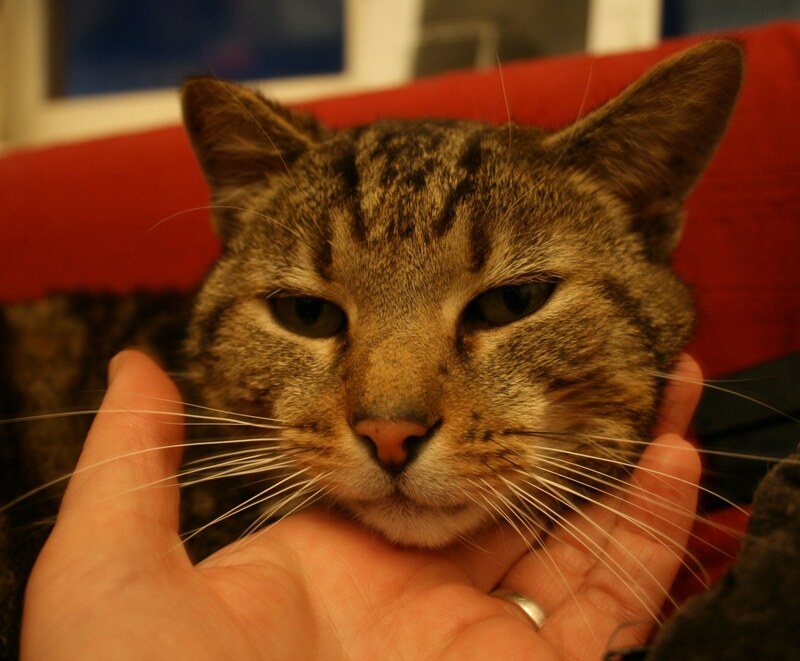 You picture indolent, macho, rugby-watching cats, burly enough to be mistaken for stripy sheep, and a bit too fond of the catnip to get any work done. Morgan is not suggesting that people ought to euthanise their cats (although he does admit, on his imaginatively-titled ‘Cats To Go’ website, that “that is an option”). No, what Morgan wants is to for people to promise to stop owning cats, when the time comes. This means you have to look into your cat’s green gaze and murmur, “You will be my last cat.” He doesn’t mention what to do about your other cat, who’s sitting there listening and thinking, “Where does this leave me?” Morgan doesn’t take into account people having more than one cat. What would be the point? Cats are all the same: having more than one cat would just mean having the same cat repeated. As it happens, the odds are stacked against Morgan, because cats are more popular in his native land than anywhere else on earth. About half of Kiwi households have a cat, which means there are some 1.4 million furry psychopaths padding silently around New Zealand, sleeping 15 hours a day and only waking up long enough to make life hell for sparrows. Oh, and rats. That is one reason why his crusade is unlikely to succeed. The other is that, well, his heart is not exactly in the right place, you might say. You see, Morgan is not an ecologist, nor a zoologist, nor a vet, nor an ornithologist. No, his field is economics. He’s also a self-described “investment manager, motorcycle adventurer, public commentator and philanthropist”, and he has a moustache large enough to provide a haven for birdlife, if only he were generous enough to make it over for their use. But mainly he’s an economist. And economics is a subject that, when applied to conservationism, becomes even ickier than usual. Economists are interested in ecology only insofar as there’s money in it, which in the case of Gareth Morgan means keeping too close an eye on the kitty, if you’ll excuse the pun. All together now: ew. The idea of losing your cat and gaining, in his or her place, an influx of slack-jawed tourists – that’s going to stick in the craw like the most stubborn furball. A bad cat, or just a bad situation? OVER the Christmas (and please, can we stop calling it the holiday season straight away, before our entire lives turn into an advertisement for Budweiser? ), lots of people probably felt like that tiger in a San Francisco zoo who apparently jumped over a 13-foot wall and attacked three people. I know, I know, a boy died and it doesn’t do to make light of it and something should be done and all that. But really, doesn’t it go to show what a disastrous effect unnatural confinement has on the animal spirit? Tatiana the tiger escaped her enclosure and attacked and killed 17-year-old Carlos Sousa, then chased after his two friends as they ran away. It was reported that the young men might have been taunting her. She was shot dead by policemen, to the dismay of animal rights supporters who felt she should have been fired at with tranquiliser darts (though really, if British police can shoot harmless Brazilians on the Underground, we can hardly be surprised at CSI-fed American ones deciding to ask questions later in the case of an irate Siberian tiger). Tatiana had a reputation for not keeping her temper under pressure: she mauled a zookeeper’s arm last year. This has led some people to castigate Tatiana now for simply being a bad cat. Other people are blaming the boys for being stupid enough to provoke a wild animal, if that’s what they did; others blame the San Francisco zoo; still others blame the government, any government. Whoever is at fault, maybe this is a good moment to ponder (yes, yet again) whether it’s time to put an end to the whole distasteful, anachronistic practice of incarcerating animals for human amusement. Zoos claim to do a vital job in preserving species from extinction. It’s hard to quarrel with that, as it seems to be an answer to a question that was flawed in the first place. But for the sake of argument: not all the zoos in the world can save those species that are lost through human destruction of their habitats. Zoos keep threatened species in such small numbers anyway that the gene pool is dangerously diminished. And of even those endangered animals that are somehow, with the aid of drugs, music and mood lighting, coerced against their better judgement into mating in captivity, how many of their offspring are ever returned to the wild? 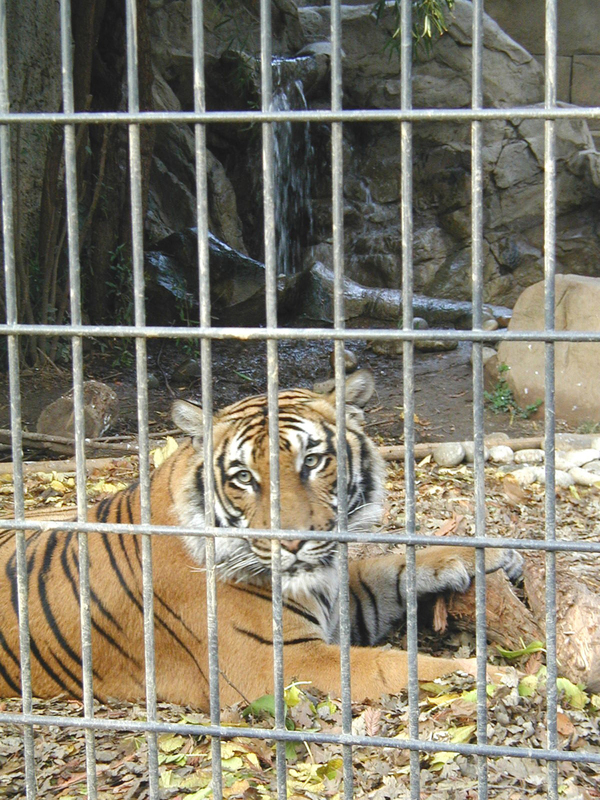 Zoos will tell you that captive-bred animals do not have the skills to survive in their natural habitat – really, how can anyone use that to make a case in favour of zoo conservation? There’s also the revealing fact that zoos tend to be home to crowd-pleasers – animals that are cute, or massive, or funny, or ferocious, or most popularly of all, animals that look and act a bit like us (as there’s nothing people like more than being reminded of the theory that monkey DNA is only 2% different from our own). Where are all the ugly endangered animals? As for the claim that zoos educate people about wildlife, it’s a sham. A miserable elephant with eyes as vacant as a methadone addict’s tells you nothing about the wonder of the natural world and everything about what it’s like to live in a zoo. You would learn more about nature by contemplating a field mouse in your own back garden. But in any case, the fact that the arguments in favour of zoos are specious is beside the point. The whole rationale of zoos is buttressed by the belief that humans are better than animals – that humans, in fact, are not also animals themselves. When you look closely at this idea, it’s hard to see on what basis we cling to it. Some people subscribe to the religious theory that suggests people have souls and animals don’t. This is quaint, and people are entitled to believe it if they want – even though they may be breaking the hearts of their children as they mourn a dead pet – but it’s based on faith, not reasoning. It can’t just be down to animals’ inferior intelligence, otherwise what are we to do about people with profound mental handicaps, or the fact that chimps are brainier than babies? Humans can write symphonies, people often say – though really, the percentage of the human population since the beginning of time who have shown they can write a decent symphony is so infinitesimal as to call to mind monkeys at a typewriter. Animals experience fear, tenderness, anger, delight, surprise, jealousy… They communicate, they remember, they dream, they form attachments, they grieve. For the most part, they are decent enough to kill only those living things they intend to eat. Even more tellingly, when you take animals out of an environment where they can apply their natural gifts and impulses, they behave exactly as people do. They overeat, they get bored, they start manifesting pointlessly repetitive behaviour, they overgroom, they can’t see the point of anything, they have to be given anti-depressants… They go out of their minds, they mutilate themselves, they become needlessly aggressive, they start killing people. They suffer. Our descendants will one day be as shocked at our imprisonment of animals in zoos as we are today about the Victorians’ partiality for gawking at human sideshow freaks. They will wonder what kind of creatures we were that we did not act on the uniquely human ability to sympathise with other living things. LESSONS learned this week, number twenty-two: When casting a David and Goliath story, remember to make sure your David is a sympathetic character, for fear the moral of the tale might be lost. The case in point is a feisty grandfather from Dublin, who has delighted observers one and all by getting the better of The Man. Eric Nolan, from Tyrrellstown, gave his grandson a €40 HMV gift voucher for Christmas. When the stricken retailer announced this week that it would not be honouring vouchers, a defiant Nolan took matters into his own hands. He and his grandson reportedly left the Henry Street shop with three games worth €46.80, after staff refused to accept the €40 token. He has pledged to post the voucher to HMV, together with the €6.80 balance owed. Note that the hero of this piece is a respectable granddad, being followed down the street (admittedly fairly half-heartedly, by all accounts) by HMV security staff. Consider how different this story might have turned out had our hero been the sort of character that people unanimously disapprove of, such as a sullen youth in a hoodie, for instance, or someone whose daddy may or may not be the highest-earning partner at KPMG, or Declan Ganley, or any one of the Healy-Raes. Having said that, Eric Nolan is not the sweet old grandfather from Central Casting either, regrettably. I know we will all have been secretly hoping for the classic Werther’s Original granddad to play the lead in this drama. Perhaps, like me, you pictured him frail but fierce, leaning on his ashplant, having a furtive browse through the Easy Listenin’ section and wondering, “Do I have space in my life for a little more Jim Reeves?”, before departing the shop in an aromatic cloud of integrity, one arm around the thin shoulders of his wide-eyed grandson (who, by happy coincidence, looks exactly like the boy who played Charlie in Willie Wonka and the Chocolate Factory). Alas, the real Mr Nolan is much too youthful and vigorous to conform to the cliché, dammit. “We are a nation of sheep, but I was determined to win this,” he said afterwards, sounding considerably more bitter than sweet, and wearing some sort of leather jacket that was all wrong for the role. And the grandson didn’t want a train set, he wanted the computer game known as Rail Simulator, which is the present-day equivalent. He also wanted Euro Truck Simulator, in which you drive a virtual truck around a virtual Europe, collecting and delivering cargo. This must be the modern version of pushing a toy truck all over the kitchen floor, hauling imaginary goods from the fridge (Switzerland) to the broom cupboard (Germany), which is the sort of game that Mr Nolan Senior’s generation would have had to make do with. The youngster’s third and final choice was an expansion pack for The Sims 3, a real-life simulation which does not, I need hardly add, simulate real-life global conglomerates being placed in receivership and real-life ordinary citizens having to engage in a bit of looting to satisfy the demands of natural justice. Yes, your sepia-tinted, Norman Rockwell-style idea of how grandfathers and grandsons comport themselves seems to have vanished, sadly. Yet despite the deficiencies in casting, props and even costume in the narrative of Mr Nolan and his grandson, the tale has captivated audiences. This is because, in the first place, the practice of teaching your grandchildren important lessons about standing on principle goes on much as it always did, and is just as much admired as ever. And in the second place, Mr Nolan’s point of principle – which holds that you are entitled, even obliged, to stand up for yourself, and to claim what you’re owed – has made a deep impression on a populace who feel, increasingly, that we’re not standing up for ourselves, and not getting what we’re owed. Naturally, however, none of those who applauded Mr Nolan’s actions this week understood his “we are a nation of sheep” remark to be a reference to themselves personally. He was talking about other people. Lessons learned this week, number twenty-three: The rest of you really are in grave need of Eric Nolan’s instruction in moral courage. 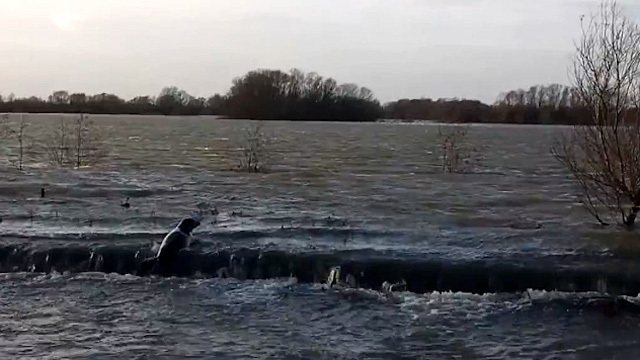 AMATEUR video footage released this week showed a seal swimming upstream in a flooded field in Cambridgeshire, some 50 miles from the coast, and looking very determined about it too. This would have to be described, on the part of the seal, as a triumph of hope over common sense. And the seal wasn’t the only one showing signs of Panglossian optimism in recent days: Eamon Gilmore was also seen furiously waggling his little flippers through a quagmire. The Tánaiste was heard to predict that we’d start seeing our way out of recession by the end of this year, and that it would be all over – possibly even including the shouting – by 2014. “We believe that we are now at a stage where we can start looking forward. We have been mired in economic recession. As we move into 2013, we will be able to look beyond that crisis,” said Gilmore, beaming. OK, he wasn’t actually beaming. In truth, his face wore a hollow-eyed, frightened look, and his fingers were crossed behind his back. That’s what optimists look like when discussing the Irish economy. Yippee, said three or four civil servants and back-benchers, on cue. But the New York Times gave the lie to Gilmore’s assurance. The paper’s European correspondent, Suzanne Daley, made a mockery of the idea that Ireland has anything good to show for the government’s austerity programme. The New York Times also published a series of black-and-white photographs from Ireland that made it look as if the past 30 years were nothing but a dream – as if we’ve woken up suddenly to find the recession has been there in the shower all along, and everybody is chronically depressed and beating each other upside the head on the subject of abortion – still. The photos show open-mouthed children, their orthodontic needs probably already in the early stages of neglect; long dole queues in the rain; broken windows; grim-chinned pensioners; working men wasting what little money they have on – gasp – cigarettes… One photo even has a couple of donkeys in it, like a John Hinde postcard seen through a glass darkly. Then, as if to bring the more recent past vividly to life, there were optimistic reports this week from websites Daft.ie and Myhome.ie that house prices in Dublin are stabilising. This prompted one Daft (the adjective cannot be helped) economist to advise the government to plan now for a new era of housing demand. Meanwhile, another prediction with a better chance of coming true came from New Zealand long-range weather forecaster Ken Ring, who prophesied a hot summer for Ireland this year. He said temperatures would stay above 20 degrees in June, July and August, and would reach as high as 30°C. Yippee, said everyone, gazing into the middle distance for a moment, like actors in an Angelus montage, and giving way to happy imaginings. Everyone pictured tranquil, sandy days at the beach, dodging jellyfish, overhearing the matches on other people’s radios, and stopping for chips on the way home, with the bag falling asunder for the sheer weight of vinegar. Everyone recalled the pain of sunburn with unalloyed pleasure. But Met Éireann soon poured 25 millimetres of precipitate scorn over the whole idea. “It is ridiculous,” thundered a pitiless Met Éireann meteorologist by the name of Harm (yes, Harm) Luijks. “Science does not allow us to forecast more than two weeks in advance,” he said, adding, by way of emphasis, that this week would probably continue quite mild. No one had really believed Ken Ring’s prediction, anyway – especially not those who remembered Mr Ring making a similar exhilarating promise last year and bitterly disappointing us all. But there is surely no harm in a little misplaced optimism (even if, as we’ve seen, there appears to be very little misplaced optimism in Harm). Everyone’s inner seal needs a little encouragement now and then.